Clara (Schwarz) Kramer was born in 1927, in Zolkiew, a town in the Galicia section of Poland (currently a part of the Ukraine). The commencement of World War II, in 1939, marked the beginning of the Russian occupation of her town. Clara, her younger sister Mania, and parents, Sara and Meir, lived under the occupation until 1941, when the Germans invaded and supplanted the Russians. In an attempt to escape the Germans, a fifteen year old Clara and her family were joined by several other families as they hid together in an underground bunker that they dug, under a home. For almost two years, the eighteen people were hidden by righteous Christians, Valentin Beck and his family, who risked their lives, even while German soldiers shared the home with them, for prolonged periods of time. While underground, Clara’s mother instructed her daughter to keep a diary so there would be a record of what occurred, for posterity. With a small bound notebook and a single pencil, Clara kept a diary of events for the next twenty months, until liberation. The original diary is currently housed in the National Holocaust Museum, in Washington, D.C. There were approximately 5,000 Jews in Zolkiew, before the war. Clara and her parents were among the approximate 60 that survived. Her sister, Mania, was captured and killed by the Germans. After the war, Clara and her family, like most survivors, left Poland and made their way to Austria and Germany, where they spent the next four years in Displaced Persons camps. It was in the DP camps where Clara met her husband, Sol Kramer. They married and moved to the newly established State of Israel, in 1949, where their two children, Philip and Eli, were born. In 1957, the Kramer family moved to Brooklyn, New York and ultimately settled in Elizabeth, NJ, in 1965. Clara and Sol, married for over 59 years, have been an active part of the Elizabeth Jewish Community for this entire time. They continue to devote their time and resources to organizations such as the Jewish Educational Center; the Jewish Federation; the Israel Bonds Organization; the Jewish Family & Children’s’ Service; the Union County YM & YWHA; and the Holocaust Resource Foundation at Kean University, which they helped to co-found. 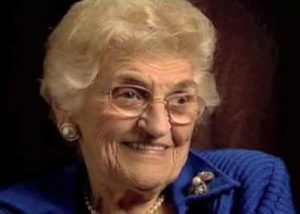 However, of all the worthy causes in which Clara is involved, her life’s work is perpetuating the memory of the atrocities of the Holocaust and the stories of bravery that resulted in the saving of lives. Clara has served as President of the Holocaust Resource Foundation, at Kean University, for the past two decades. During this time, she has lectured at hundreds of schools throughout the Metropolitan area, telling her story of survival. She has worked together with the Kean University Holocaust Resource Center, accompanying groups of teachers as they made their pilgrimages, each semester, to the National Holocaust Museum, in Washington, answering questions and validating the teaching of the Center with her real-life experiences. 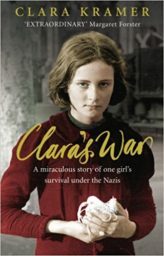 Clara has recently authored a biography of her wartime experience called, Clara’s War, that is scheduled for publication, in Europe, in April of this year. She hopes that this book will continue her mission of “telling the story”, long after she is gone.